Get free alerts via SMS text messages or emails when your website goes down. 100% Free Unlimited Website & Server Monitoring For Anyone! With our network of probe servers at our world-wide datacenters, we can monitor every minute that your sites are accessible from all over the world. View detailed uptime and response time reports in any date range. We do not limit the number of monitoring checks you create. 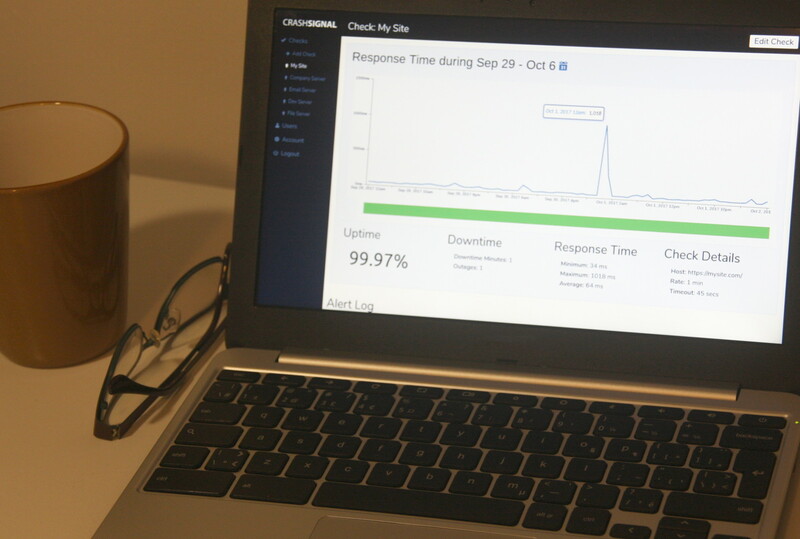 Setup your account to track the uptime of as many of your websites as you need. Receive alerts instantly via emails and SMS text messages, without limits, free of cost to you. All incidents are verified by a second probe server at another monitoring location to eliminate false alerts so you only get alerted when a downtime really occurs. Put away your credit card. This is not a trial, there are no hidden fees and no surprises. CrashSignal is a free service that helps website owners and online businesses monitor their website uptime, track server response time and get notified by email and SMS text message alerts when their websites become inaccessible to visitors. CrashSignal is easy to use and understand, but best of all it is free for systems administrators of large corporations, webmasters at small businesses, IT professionals and even personal website owners alike. At CrashSignal, unlike other uptime monitoring services, we never charge for website uptime monitoring, performance reporting or even downtime alerting. We respect your privacy, so you will never get promotional emails from us, you do not even have to provide us with your full name or address. Setting up an automated monitoring check for a website or a service takes less than a minute, requires no technical skills, plus our reports are instant and easy to understand. You may add any number of monitoring checks, use all of our remote monitoring servers, add unlimited sub-users and receive as many email or SMS alerts as you need to stay on top of your uptime! We continually improve the service by making it faster, easier to use, expanding our remote monitoring network and by constantly adding new features. For this great free service all we ask for is to spread the word and respect our fair use policy. How do we do it? How could we offer this great service for free of charge? By keeping our operating costs down and accepting donations. We are also open to investment opportunities.